Getting a Yellow or Red light on your sidebar below-the-fold ad performance? Let's work on that! 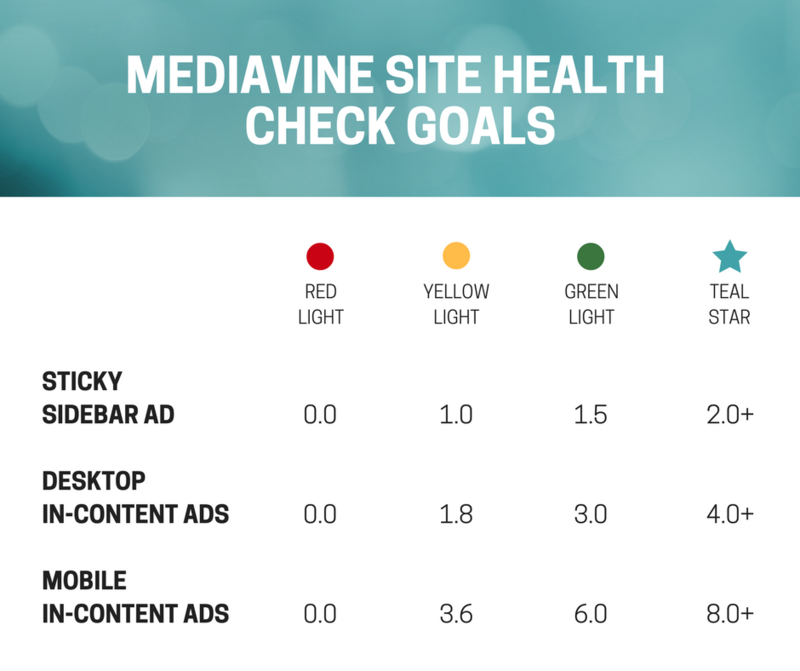 The sticky sidebar ad is the best performing unit across Mediavine. Why? Because it's the unit that is MOST visible. Readers can't scroll past it. It sticks with them, as they scroll down your content. The sticky sidebar ad MUST be the last thing in your sidebar. It's not allowed to scroll over other content, or other ads, per ad exchange rules. It's allowed to auto-refresh for another ad impression after 30 seconds in view. That means extra ad impressions without needing more pageviews. Dolla dolla bills, y'all! How much "stuff" you have in your sidebar. This unit is lazy loaded. It does not load until someone scrolls near it. The longer it takes them to get there, the less time they'll have it in view. That could mean no second ad impression from refreshing, and poor viewability score on the first impression. Short content. The less "height" your content in the main content column has, the less time the ad will have to scroll with the reader. Where's your MVC (Most Valuable Content)? This is the focus of your blog post — the thing readers want most. Food bloggers, are you running your recipe card at the top of your post, or in the middle? What about your packing tips? (Looking at you, travel bloggers!) Or how about your craft supply list, crafting bloggers? High amounts of traffic going to pages with no sidebar. If you have a lot of traffic pointed at pages that DO NOT have a sidebar, you could possibly see that reflected here. Since two of our more lucrative placements are located in the sidebar, it's a good indicator for potential revenue being left on the table! Stop and think about why someone is visiting your site. Whether they're regular readers, or came at you from Pinterest or Google, they're typically looking for something more than your narrative, be it a recipe card, craft supply list, kids' printable, or essential packing list for backpacking through Thailand. It's not out of order to put that at the bottom of your post, thus ensuring that the reader spends some time seeing both the narrative you've spent a good amount of time writing, and seeing your ads. Making your readers work a little bit for the most valuable content on the page also increases your "dwell time." It's agreed upon by most SEOs that dwell time plays at least a moderate role in how the engine rates your content. Dwell time is thought to be the measurement of time from when the reader comes to you from the search engine to when they go back to the results. The faster they do that, the less quality your content is assumed to be. If your sidebar content is nice and short, the ratio of time between when the ad loads (because someone scrolled near it) and when they get to your valuable content is big. Huge. They'll have hopefully gotten at least one refresh of ad too. Let your readers tell Google you're good people. And earn you a little ad money while they do it. Get rid of any non-essential stuff in your sidebar. Keep it tight; bio and headshot, search bar, social media icons, three recent or popular posts. Make your content taller. More paragraphs (break up the ones you already have into chunks of 1-3 sentences! ), more photos (vertical adds LOTS of height), block-quotes of interesting information, infographics and charts. Makes sure your Most Valuable Content is at the END of your post. Email publishers@mediavine.com if you make changes to your sidebar, so that we can make sure your ads are still placed correctly.